Welcome to BusZone's unofficial page about Johnsons Coaches. Their official website is www.johnsonscoaches.co.uk. 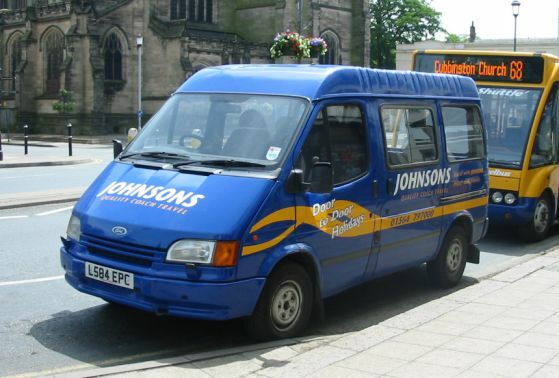 Johnsons operate a number of tendered bus services in the Warwickshire area, and run a fleet of modern low floor buses. 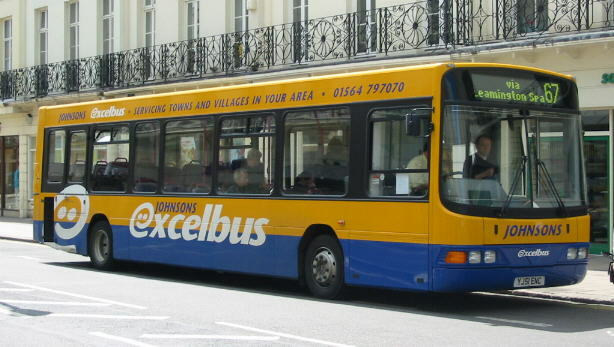 The low floor fleet is branded 'Johnsons excelbus'. 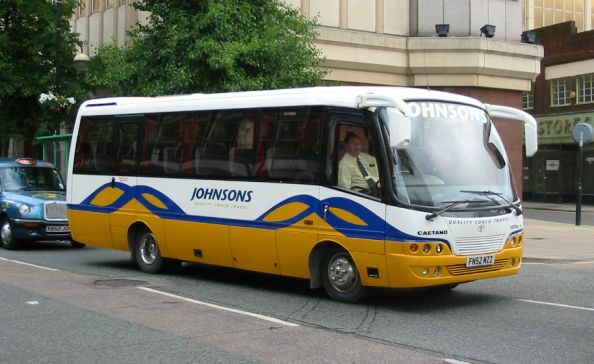 In June 2003 Johnsons were voted Coach Operator of the Year for operators with less than 40 vehicles. This is Mercedes-Benz N815 CDA on the Parade in Leamington on 10th December 2001. This is Ikarus 480 Citibus J24 GCX on the Parade in Leamington on 4th May 2001. 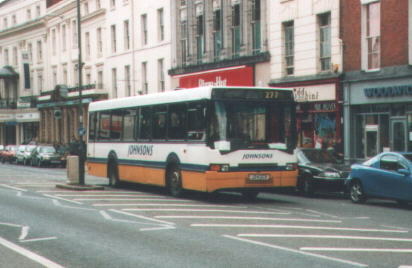 Optare Solo YM52 TSO at the end of its second week in service on 19th January 2003. The second Solo YM52 TSU is branded for the Warwickshire County Council sponsored Mon-Sat 'Southam Shuttle' service launched in January 2003. It is seen here on its day off operating Leamington Sunday route 68 on 19th January 2003. Wright Cadet YJ51 ENC at a similar location when only a few months old on 5th May 2002. DAF SB220 / East Lancs Myllennium YG02 RHZ when just over one month old in Leamington on 19th May 2002. UVG bodied Dennis Darts R78 GNW (front) and R83 GNW (rear) opposite the Parish Church in Leamington seen not long after acquisition on 5th May 2002. 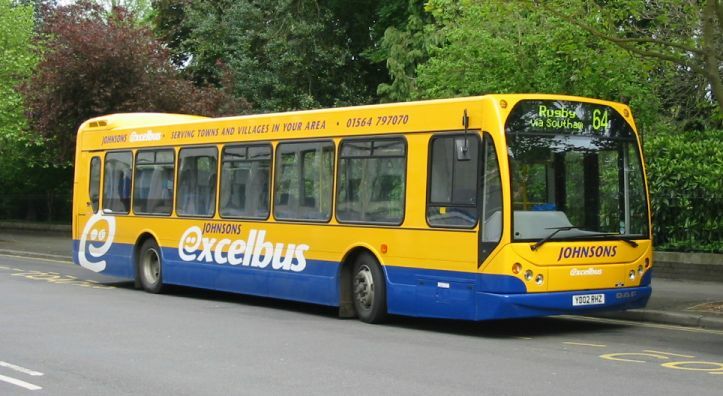 They were purchased second hand by the county from Travel Ludlows in 2002. 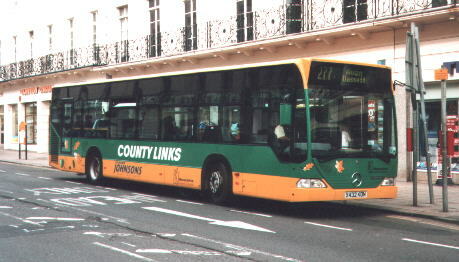 This is Mercedes Benz Citaro X432 KON on the Upper Parade in Leamington on 18th June 2001, part of the first batch of four vehicles purchased by the County in October 2000 (two operated by Johnsons). They feature 3+2 seating. Johnsons operate a fleet of roughly 40 coaches, most of which are Bova Futuras. They also have a small number of minibuses and social vehicles for personalised service. Ford Transit L549 LWC in Leamington Spa on Sunday 19th January 2003. Similar Ford Transit L584 EPC in Leamington Spa on Sunday 22nd June 2003. FN52 MZZ is a Caetano Optimo V, and is in Coventry City Centre on 18th June 2003. Bova Futura RJI 8685 on 1st February 2003 at Leamington Spa Station. Bova Futuras B10 JCT, M173 SBT, B12 JCT, B13 JCT and B11 JCT opposite the sports centre at the University of Warwick on 6th December 2001. Bova Futura M173 SBT on Library Road at the University of Warwick on 25th May 2002. Bova Futura Y657 HWY near to the Rivermead Leisure Complex in Reading on 11th August 2001. The last four photos show quite nicely how the Futura has evolved over the years, with Johnsons making continual purchases.